GANDHINAGAR: In an important policy decision to curb widespread real estate speculation in 181 Gujarat Industrial Development Corporation (GIDC) estates, Gujarat government has decided to bar resale of vacant plots. "The decision is expected to force those who have bought plots in GIDC estates just for investment purpose to either set up factory on the vacant plots, or to return them to GIDC," a senior official said. GIDC, which has moved to implement the decision, has identified 1,811 plots on 800 hectares (ha) lying unutilised. It has served notice to 553 of them with the ultimatum. 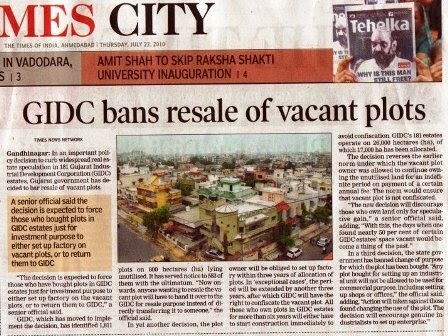 "Now onwards, anyone wanting to resale the vacant plot will have to hand it over to the GIDC for resale purpose instead of directly transferring it to someone," the official said. In yet another decision, the plot owner will be obliged to set up factory within three years of allocation of plots. In exceptional cases', the period will be extended by another three years, after which GIDC will have the right to confiscate the vacant plot. All those who own plots in GIDC estates for more than six years will either have to start construction immediately to avoid confiscation. GIDC's 181 estates operate on 26,000 hectares (ha), of which 17,000 ha has been allocated. The decision reverses the earlier norm under which the vacant plot owner was allowed to continue owning the unutilised land for an indefinite period on payment of a certain annual fee. The norm would ensure that vacant plot is not confiscated. "The new decision will discourage those who own land only for speculative gain," a senior official said, adding, "With this, the days when one found nearly 50 per cent of certain GIDC estates' space vacant would become a thing of the past." In a third decision, the state government has banned change of purpose for which the plot has been bought. "Any plot bought for setting up an industrial unit will not be allowed to be used for commercial purpose, including setting up shops or offices," the official said, adding, "Action will taken against those found changing the use of the plot. The decision will encourage genuine industrialists to set up enterprise."